Do you know that the perfect danceable music that I have been listening to every weekends are from the Zumba classes that I have been attending to? When I check their audio, I just discovered that its from JBL. 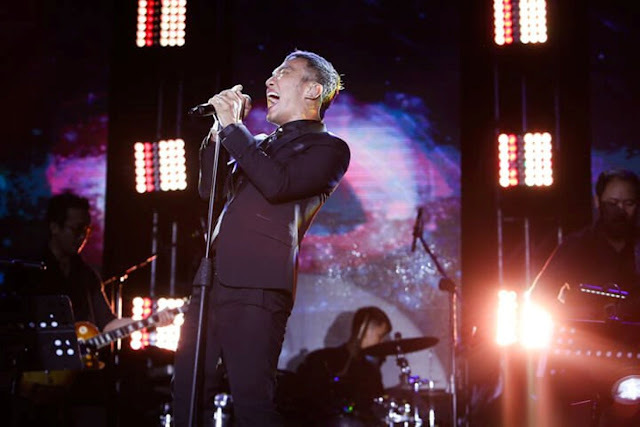 It really doesn't matter the venue, as long as you have the perfect music to get things going and keep you moving. Parties and other wild and wooly events need the perfect booming sounds to make it the talk of the town and create that solid impact. So how do you make them as epic and fantabulous? Deliver the sound and make your party reverberate with all the thud, clatter and tinkle anywhere you want. The tried-and-tested JBL Boombox and the JBL GO2 from JBL, from the world’s leading electronic audio authority, will surely make any party big or small live up to expectations. Experience sound like you’ve never heard before in a boombox with the JBL Boombox. This powerful and portable Bluetooth speaker delivers enormous sound and the hardest-hitting bass to bring the roar and the rumble of your music all day. With just a single charge, you won’t miss a beat as you party all day, all night thanks to its humongous 20,000mAh battery. You can even charge your phone or tablet while your rock to the music, a sample of the JBL Boombox’s versatility and diverse functionality. It’s so ruggedly designed you can bring it to any wicked party. The IPX7 waterproof casing makes it an ideal all-weather speaker for your indoor or outdoor parties: by the garden, the beach or at poolside. With a few button pushes, you can switch modes to optimize sound quality, with deeper, richer bass in enclosed spaces, or stronger and capacious sound when you bring it outside. And if in case the JBL Boombox is not yet enough, the JBL Connect+ feature lets you add more speakers within Bluetooth range. Just press a button and voila! You have a speaker network at your disposal. 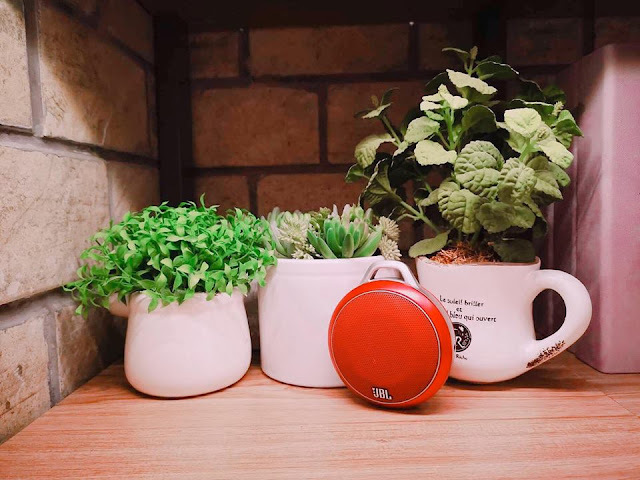 Now don’t dismiss it yet by looking at its diminutive size because the JBL GO2 is packed with that signature JBL sound despite its small form factor. It can pack a punch! Stream your music from your phone or tablet or take your calls and the sound is still crystal clear and perfect. Enjoy up to 5 hours of unceasing playtime so you can enjoy your music to your hearts’ delight. Bring it to your living room or garden for your small family parties or reunions, or you can just grab it and go to take a dip at the pool or the beach and make your revelries with buddies or officemate come alive. It really doesn’t matter. The JBL GO2 will still make a splash with its IPX7 waterproof design, and with its built-in noise-cancelling speakerphone feature, hear what’s on the other side of the conversation with much clarity. Best yet, the JBL GO2 has got multi-sensory appeal because it’s not just an audio delight but an eye candy, too, with 12 eye-catching colors to chooses from to spice up your style profile to all-new heights. But aside from bringing booming sound to your parties, these two rockin’ devices will also give you the chance to celebrate and revel in Las Vegas, Nevada, USA. Get ready to experience the true JBL sound in the world’s biggest musical sound extravaganza, the JBL Fest 2018. 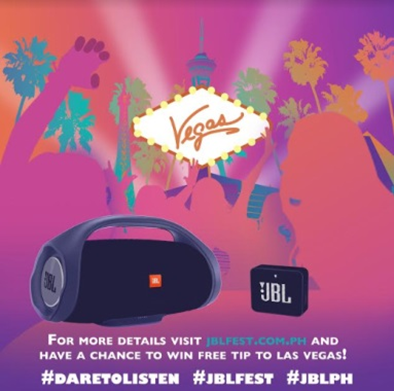 From July 1 to August 31, 2018, just buy any JBL, Harman Kardon, or AKG products at all participating JBL concept stores, kiosks or authorized dealers in the country and be one of Five winners who will fly all the way to Las Vegas for JBL Fest 2018 and get to see and meet up close and personal some of the world’s biggest stars. To qualify, go to www.jblfest.com.ph and register to get a raffle entry that corresponds to the amount of product purchased. The JBL Fest 2018 promo is open to all JBL customers in the Philippines and should have a valid passport and US visa. Winners can only win once and will be responsible for the processing of required travel documents. Travel date will be in October 2018. After a successful initial staging last year, the JBL Fest is fast shaping up for another run this year for that sizzling-hot very VIP experience. Lots of music icons and celebrities will converge at the World’s Entertainment Capital for JBL Fest 2018, all set to rock it out to the beat of JBL’s one-of-a-kind sound people the world over love and adore. So don’t miss this once-in-a-lifetime opportunity to head off to Las Vegas, Nevada for JBL Fest 2018. For more details, visit the JBL Facebook page, www.facebook.com/JBLPhilippines or follow them at Instagram (@jblph). Per DTI-FTEB Permit No. 10373 Series of 2018.